Well, I had decided to do some stuff on the railway today but the weather has been bloody awful. So, with obligatory coffee and fag to hand (cigarette not manservant of questionable morals) I knocked up a quick plan in the absence of my much awaited photos. The main line is a double track with a station and a loop next to the branch line for my operating mail coaches. The branch runs from the shed and will eventually run into a bay in the main station...once it exists! As yet, the Main progress has been visually slow as it is the most labour intensive, namely the concreting (my poor back...) and the earth works in the flower bed area. Oh, and the erection of my sanctuary, aka the Shed/Castle. Anyhow, the weather has perked up a bit and my spare labour (thanks Ben) has just arrived. Last edited by Infrontcat on Sun Mar 25, 2007 7:10 pm, edited 2 times in total. Chris, are you my fairy godmother or something? Seriously though, thanks mate. It's turning out to be a nice day so it's full steam ahead in the garden at the mo. I'll post when there's progress to report! Infrontcat wrote: Chris, are you my fairy godmother or something? All I can say is Good Luck!!! That's some plan, be nice to see a shot of the garden. You need to get that Digital Cam out and get some pics. You said you would some months ago. Nice plan! Get some pictures! Please! Aye I know. Kelly and I had a bit of a "to do" so things haven't been pressing on at such a pace. However, the industrial action (Work to rule ) has now ceased and it's pretty much all steam ahead again. Beside's, I've had to give my friend his camera back for a bit. But it will happen soon! Martin is having an affair with some other man now is he. Well, I had intended to do some things on the garden railway today, but it's raining down like the proverbial coach party from Incontinents Anonymous. Just my blooming luck! Also, the boards I weatherproofed on Friday haven't dried, so I couldn't really do anything with them today in any case. Anyhow, I did at least manage to re-wire a few things for the shed section. 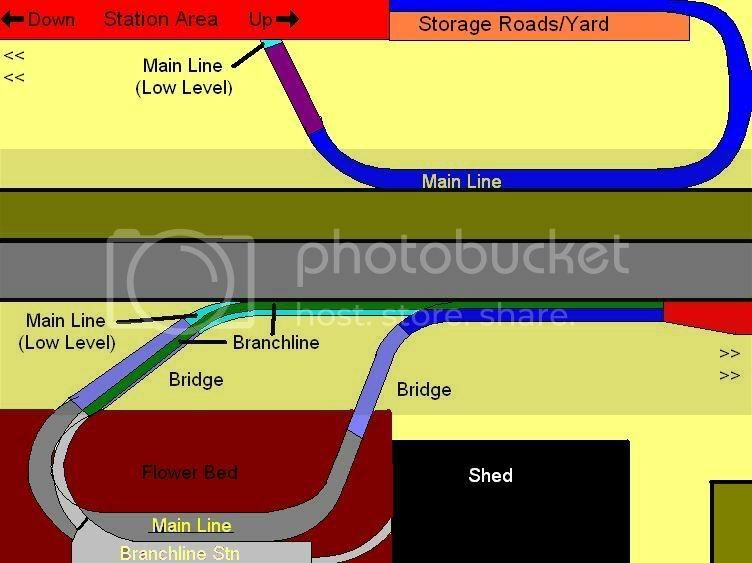 I also finalised(ish) the track plan for the main line next to the branch and have pretty much made up my mind about where the supports for the branch should go as it crosses the main line. Hopefully, the rain will hold up a little better next week. If you are really bored, you could take a peek at my blog. It's not just railway related, but it helps me to pass the time on days like these! WARNING: the language is a little 'colourful' in places, so please don't read if easily offended! Oh, and don't be confused: Moffy is my nickname from way back! Sadly, the photos are not forthcoming. However, the monsoon has stopped and I was able to at least go out and measure up and cut some timber. I've just about sorted the mainline section that runs parallel to the branchline next to the shed and hope to maybe lay some track tomorrow. Mean time, here is Wilfred. He's quite literally the Fat Controller around here. He's the first cat I got that actually lived with me. My real first cat lives with my mother in Wales. He's called Wilfred. Unless he gets in my way, when his other name 'Stupid Fat Animal' is the preferred option. He is a cool cat though and he sites train-hunting as a convenient and harmless past-time. The sections highlighted in Grey are those nearing completion! Anyhow, my friend is copying my pics on to a CD, so hopefully post them here this weekend! 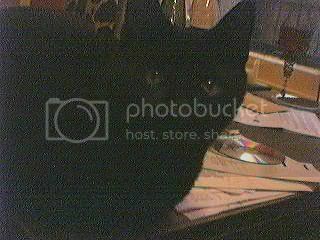 Infrontcat wrote: here is Wilfred. He's quite literally the Fat Controller around here.